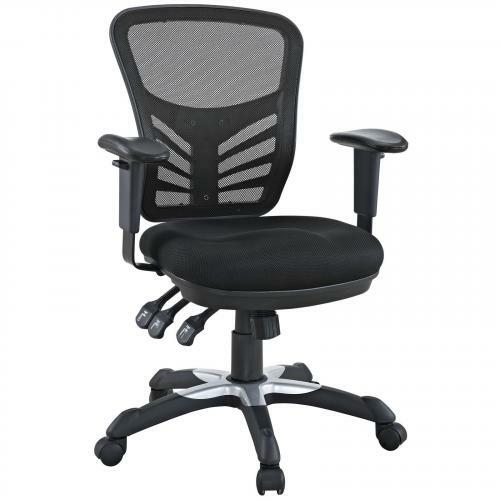 Mark a turning point in your office tasks with this upright and ergonomic mesh office chair. Let the breathable mesh back and plush fabric cushion seat serve as a simple extension to your everyday home and business ventures. The back height and seat depth are both easily adjustable to fit your height and size, while two sturdy armrests height adjust to assist your vertical seat posturing. Articulate also includes tilt tension and lock functions to recline and incline comfortably as needed. Fitted with five hooded dual-caster wheels, give yourself the ability to easily glide over carpeted floors while naturally performing tasks without exertion.